All the new items you can now find in the store are made with Johns input and supervision to give the most awesome J5 merch possible. All the custom items are put together and manufactured by Forgotten Saints LA. The same team that creates and makes all of Johns stage wear. In fact with all the custom items Cody from Forgotten Saints will be making it for you. We will be bringing you many new items and all the classic that you love – Pre order now for the first round as we’ll start shipping March 10th. Let’s Rock! This entry was posted on February 23, 2013. 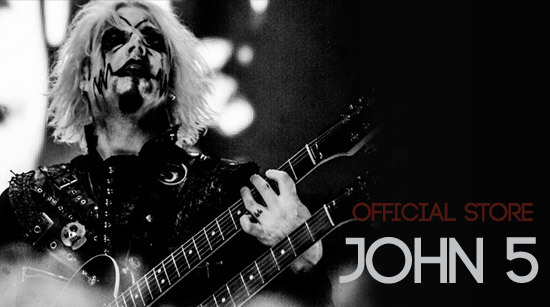 It was filed under Store News and was tagged with John 5, Merchandise, Store news, Welcome.